You are here: Home / Featured Post / Why Jeremiah 29:11? If you’ve been following my site for awhile, you’ll know something about me, one of which is my love for Jesus Christ. Something else I’ve talked about before on this site is Johnny Oates. I’ve always liked Johnny Oates. As you probably know, I grew up in Philadelphia. Back in the mid 70’s Johnny was a Phillie for awhile. He was the backup to Bob Boone mostly, but there was one year where he was the #1 catcher (1975, if I remember right). While I don’t truly remember the first baseball game I went to, I do recall Oates being a Philly at games I went to, so it stuck with me. Also, the baseball card image to me was one I always liked when I was a kid. The reason for that is back then you didn’t see spring training at all. It’s not like today – unless you traveled there, seeing video from spring training didn’t happen. Or didn’t for this kid. So I liked this card. It showed Johnny at the Clearwater facility the Phillies were at then. On top of that I always liked this card design as the years went by. So I latched onto this card as one of my favorites as I was a kid. Fast forward to my moving to Texas. I was here for just two years when the Rangers announced that Oates was going to be the new manager here, and that got me into the Rangers. I had seem some games at Arlington Stadium in its final season. But I didn’t really get into the Rangers until 1995 when Oates (and another former Phillies pitcher, Kevin Gross) were on the team. As his tenure went on, we had great success, and I found out more about him as I was now an adult. Found out about his strong sense of God. He believed, and wasn’t afraid to say it. Makes me wonder what it would have been like had Josh Hamilton been a Ranger when Oates was still a manager. I would have loved to have heard some of those conversations. Even through his illness and death, he was extremely upbeat about God and Jesus. He never (to me) seemed mad at his situation, blamed God – he continued to praise him, which was awesome! I loved that more than the baseball stuff he was known for. 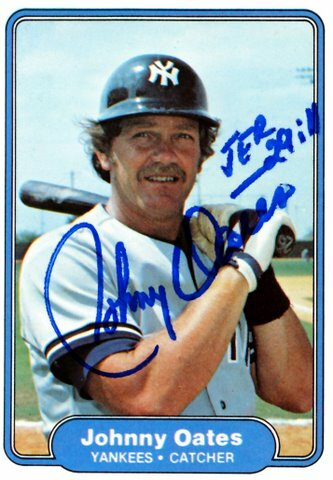 Anyway, over time I collected Johnny Oates baseball cards. A handful of them I had him sign personally (including the card image above). One of the ones I have of his was one of his final player cards, the Fleer 1981 card when he was with the Yankees. On this card, he signed Johnny Oates Jer 29:11. That’s the source of the quote above. Given how much Oates meant to me baseball wise, and his strong connection to the Rangers site, I decided to stick Jeremiah 29:11 in my site’s header and tell this story. I miss Johnny, his strength was a great inspiration to me, and when I was going through my recovery from my leg surgery, I thought about him and his strength when I was having problems with pain and moving around. It helped a lot. So God bless Johnny Oates, and his family for sharing him with us in the baseball world. Furthermore, a few months ago I decided internally to talk more about God & Jesus on this site. I’m not going to go over the top with it, but if the discussion lends itself, I will use that. One of the things I’ve suffered from for awhile is “Spiritual Schizophrenia”. That’s where you believe in God, and then you “turn it off” in other parts of your life. That you are only doing “that church stuff” when you’re in church, and the rest of your life doesn’t have it. I’ve made a few comments along this line lately on my site, and I have to say – the feedback I’ve gotten since I started doing that was encouraging. I wasn’t sure if people wanted to hear that, and then God moved some people to let me know that perhaps yeah – it is the right thing to do. I’m not turning this into a religious blog. It’s still a Rangers site, and it will be baseball, but I won’t be afraid to witness if the situation dictates it. I am me still, I’ll probably still say things of a strong nature when my emotions carry me there. Good for you, Joe! It’s really encouraging to see, hear, read, etc someone sharing their faith in Jesus, and I commend you for it. I know you won’t get a lot of positive feedback, but I Johnny Oates was a hero of mine, and I really enjoyed your story. Any Bible verse is a good verse. Well maybe not Judges 20:46. It is not exactly encouraging, but we all can still learn from God’s discipline. :-) Keep it up. My cancer is now in remission, I give all credit to the Lord! Jamey Newberg referred to your blog a month ago and I came over to check it out. I have been coming back ever since. I love the fact that you don’t hide your faith for fear of what others think. Continue preaching the gospel and letting your little light shine. You have a new fan and avid reader. Joe, lets start off cliche and say i love your site. Anyways, I’m a board operator for a local radio station that broadcasts all Ranger games, so basically i am forced by my job to watch every game. Still as i sit here watching my team get pounded 12-0 by the royals, i wear a smile(kinda). 12-1 because Blalock hit a home run. To the point, i guess i’m a moron because everytime i try to sign up to try and leave a comment, i put all my info down but i am denied because it says that the URL that i entered is wrong. Please send me a helpful email if you find the time. Great article Joe. I am a Cleveland Indians’ fan, but the Rangers seem to have the Indians’ number when they play each other. And, you already know my love for Jesus, too. Keep up the good work. My favorite verse has always been Galatians 2:20 I have been crucified with Christ, it is no longer I who live but Christ who lives in me and the life I now live in the flesh I live by faith in the Son of God who died and gave Himself for me. Thank you Joe and God bless.